Further to the useful tips and advice provided on the website, a number of helpful guides have also been made available to download. These guides have been developed to provide you with additional information on how to protect yourself online, not just banking, and also how you can prevent yourself from becoming a victim of fraud and internet scams. In a Coronation Street storyline broadcast in February, Gail McIntyre lost £40,000 from her online banking account after conman Lewis secretly prints off and got hold of her log-in and password. Yet Gail isn’t alone in failing to keep her online banking details safe - a Pay Your Way survey revealed that one in three people admit sharing online login details with someone else. 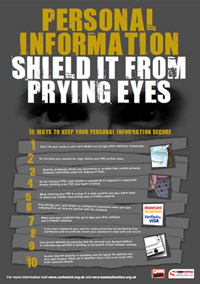 This guide provides you with top tips on how to shield your personal information on how to shield your personal information from prying eyes. 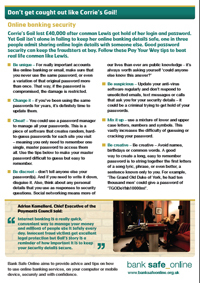 This guide is from an Education and Awareness campaign which discusses how fraudsters may pose as an employer, asking you to receive money into your bank account.